The Index of Small Business Optimism increased 0.5 points in February to 101.7, according to the National Federation of Independent Business (NFIB), ending a 5-month decline during which the index tumbled to the lowest level since US President Trump took office. The decline of small business optimism was amid overall growing economic uncertainty and the partial US government shutdown and tracked with a declining consumer confidence index. As compared to the previous month, more US small business* owners expressed confidence about future business conditions and planned capital outlays. Owners also said that it is a good time to expand. Interesting responses given that earning trends weakened. 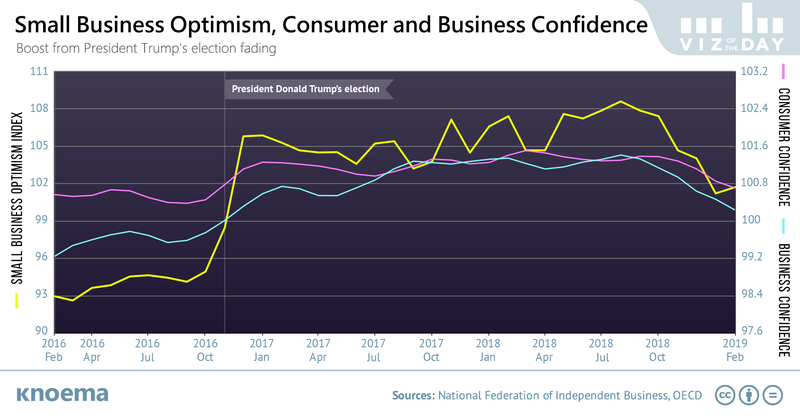 The Small Business Optimism Index is composed of 10 equally weighted and seasonally adjusted variables from the NFIB monthly member survey that covers topics ranging from outlook, earnings, and sales to investment and credit conditions. Small business is important business in the United States. According to the US Census Bureau, of the 5.9 million US companies in 2015, 3.6 million had fewer than five employees and employed a combined 5.9 million people, or about 5 percent of total US employment. Sentiment and economic importance of small business is uneven geographically, a point that will likely resurface when the US 2020 presidential election campaigning begins in earnest. Learn more about which states are considered small-business friendly. * According to the US Small Business Association's size standards, 'small business' varies by industry, but for most, a business is defined as small if it employs less than 500 employees or earns less than $7.5 million a year. Most small firms work in professional, scientific and technical services, construction, retail trade, and health care.